Torill Kove's grandmother often told stories to Torill when she was a young girl. One in particular revolved around ironing shirts for the King of Norway. In 'My Grandmother Ironed the King's Shirts', Kove follows a thread of family history, embroidering it with playful twists along the way, imaginatively rendering her grandmother's life and work in Oslo during World War II. In Kove's retelling, her grandmother leads a Norwegian resistance to the invading German Army who had forced the King to flee for his safety. When the task of ironing the King's shirts was replaced by those of the German Army officers, Kove's grandmother and her shirt-pressing sisters sabotage the enemy uniforms until morale among the Germans is so low that they lose the war and head home without a thing to wear! Full of sharp humor and myth making, 'My Grandmother Ironed the King's Shirts' is a great example of how small contributions to the greater good count for a whole lot. 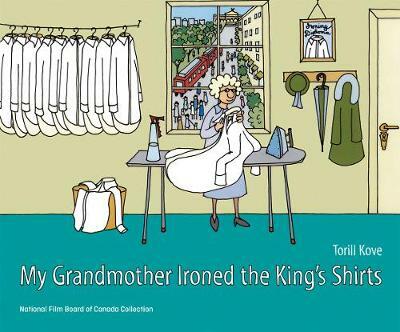 'My Grandmother Ironed the King's Shirts' was nominated for an Oscar in 2000 and won 17 awards in all. It has also been produced as a book in Norway.